We are expanding our offerings for joint health because Dr. Harman feels it is important to vary the types of products used every year or every few years. Each joint supplement works on different biochemical pathways inside the joint, and the joint is a complex structure. Consequently, variation in types of supplements will give the best overall long term effects. For a few horses, you will find that oneparticular product is superior to all others, in that case, stick with what works. In all cases, if you try a supplement and do not see results in 1-2 months, change to different type of product, or check the quality of the one you are using. 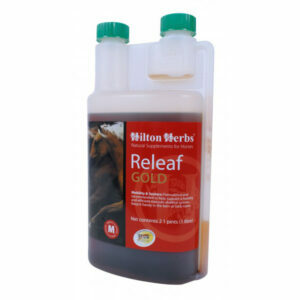 All products sold here are of top quality and will give good results, if they are correct for your horse. 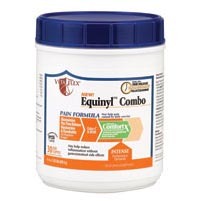 Equinyl™ Combo is a new formula in the successful Equinyl line from Vitaflex. It may help ease pain and inflammation associated with training and competition without causing gastrointestinal side effects. it contains a patented compound called Microlactin™ or ComfortX™ made from milk protein which may reduce swelling and inflammation associated with training and competition, provides joint health support, increases flexibility and shortens recovery time by reducing the emigration of neutrophils to the site of the inflammation. 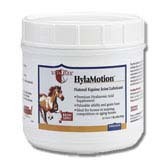 There are two types of glucosamine in Equinyl Combo. The first is regular glucosamine, which provides an immediate supply of glucosamine HCI while the second form, Patent Pending Time Release Glucosamine, releases over 24 hours.